The number one Belgian was Tom Boonen, who might actually be a strong contender for that title in a broader sense. The second cobbled classic was meant to finish with a bunch sprint. All the previews said so and so did the TV commentators, making you wonder why the hell they’d started broadcasting with two hours to go. Fortunately, the Belgians had other ideas. They might not have had a Grand Tour winner in 30-odd years, but by the lungs of Merckx don’t mess with the Belgians on the cobbles. These are their races and they know how to win them. The enthusiasm’s obvious even when you haven’t the faintest clue what they’re saying. The riders of Omega Pharma – Quick Step (a Belgian team) and Belkin (a Dutch team) hammered away at the front after each of the short, bastardy climbs that appeared in the middle of the race. Each time, those further back in the peloton struggled to chase back on. These riders had come to a virtual standstill on the slopes, which is what can happen when a large peloton hits a steep, narrow hill. The Beneluxians exploited this. By the time they got back to flat roads, there were several different groups. Normally, you’d expect the larger, chasing group to gain on those ahead, but the lead group was something of a who’s who of cobbled racers. Pretty much everyone you’d rely on to reel in a break was actually in it. Tom Boonen was the fastest sprinter among them and he had four team-mates with him in what was a 10-man group. They were good odds. Strade Bianchi, an Italian one-day race, was only created in 2007, but it’s become very well-regarded. 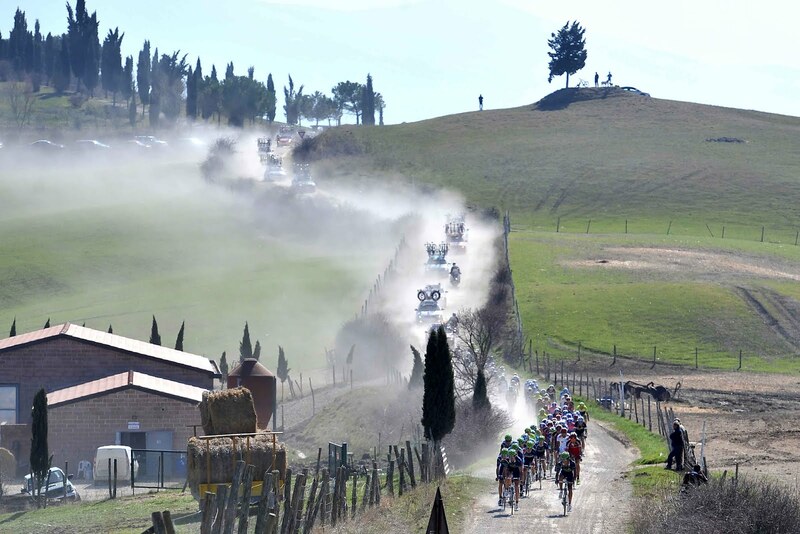 Instead of cobbles, it does gravel (strade bianchi means ‘white gravel roads’) and it takes place on Saturday. Roma Maxima follows the next day. Sunday also sees the start of Paris-Nice, which is a bit of a funny one from a narrative point of view being as I’m hell-bent on trying to persuade you that it’s classics season. It’s best to think of the race as having two distinct narrative strands. It is the first major stage race of the season and so there’s a main plot relating to the Grand Tour contenders. It is good preparation for the really big one-day races, so a lot of classics riders will be using it to fine-tune form and we get to see how they’re going. The above pretty much goes for Tirreno-Adriatico as well, which begins a few days later.